Anticipation. Intrigue. Waiting. Buildup. Blood. Sweat. Tears. Sacrifices. When looking at the WNBA Draft through the eyes of one of the talented women that are prospects, those are definitely words that apply. 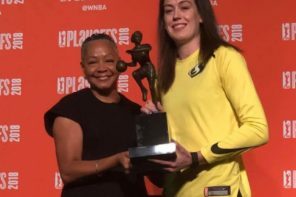 All culminating in hearing one’s name called out by the WNBA’s president and making it official that everything was all worth it – the good times and hard times. That became reality for 36 basketball players who all heard their names called by Lisa Borders as draftees. Needless to say, they got next and fans from Seattle to Connecticut, from Minnesota to Atlanta are ready to watch them work. The stage is set and we’re here! Congratulations to all the ladies tonight. One of the worst kept secrets within W circles was whose name would be called first as the first ever draftee to the Las Vegas Aces. That was A’ja Wilson of South Carolina. Another one from the Dawn Staley factory that is Columbia has entered the ranks of the WNBA. The second overall pick was that of the Indiana Fever, and plenty a draft board figured that with Azura Stevens declaring for the draft late that she would be, potentially, the second-overall selection behind Wilson. Instead, the Fever stayed in the Midwest and chose Kelsey Mitchell out of Ohio State. Following the Fever was the team that plays just up I-65 from Naptown. The Chicago Sky had the third and fourth overall selections as they prepare to play their first season at Wintrust Arena in the South Loop. They picked Diamond DeShields out of Tennessee (and Turkey) with the third selection – her father, former Major League Baseball player Delino DeShields, played briefly with the Chicago Cubs. Moments after being drafted 3rd overall by the Chicago Sky, former Lady Vol Diamond DeShields on her journey: "I'm just more motivated now than I ever have been." With the fourth overall selection, they chose Gabby Williams – the first UConn Husky selected in the 2018 WNBA Draft. Another surprise given the late declaration of Stevens in the draft. After the Sky went back to back, it was Seattle’s turn to select. Many observers felt that the Storm would select a point guard who could be a potential heir apparent to the ageless wonder that is Sue Bird. The Storm stayed on the west side for its fifth pick, choosing Jordin Canada from UCLA to join their big three of Bird, Breanna Stewart, and Jewell Loyd. Following the Storm were the Dallas Wings, selecting with the sixth pick. The Wings, arguably made the biggest splash of the WNBA offseason with the signing of Liz Cambage, adding her to a team that made its first-ever playoff appearance as the Wings in 2017. Joining Cambage, Skylar Diggins-Smith, and reigning WNBA Rookie of the Year Allisha Gray in Big D was UConn’s Azura Stevens. Next up were the Washington Mystics, a team that advanced to the playoff semifinals last season, but will be sorely missing Emma Meeseman heading into 2018. Mike Thibault’s team selected Texas’ Ariel Atkins with the eighth pick. Atkins was not in attendance in New York City for the draft. How would the Indiana Fever follow up their selection of Kelsey Mitchell with the second overall pick with their eighth overall selection? It was an element of the Briann January trade which sent her to Phoenix. Pokey Chatman and the Fever went with someone who has a plethora of postseason experience at the collegiate level, going with Victoria Vivians who led Mississippi State to back-to-back national championship games. At the ninth pick is a team on the rise like the sun…the Connecticut Sun, of course. They will be bringing back the 2017 Coach of the Year in Curt Miller and the 2017 Most Improved Player in Jonquel Jones. The Sun selected Lexie Brown from Duke to join the young core they have assembled in Connecticut. We know where the New York Liberty will play its games in 2018. We know that the Liberty will be entering 2018 with a first-year head coach. We know that the Liberty have been a team that has been a consistent playoff contender, but a championship has been just out of their reach. New York hopes that Kia Nurse can change those fortunes as they picked the third UConn Husky to be selected this draft. Speaking of international players, apparently the Los Angeles Sparks got some ideas from their friends in Gotham. 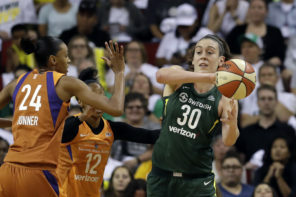 Of course, Brian Agler’s team has made the WNBA Finals against the Minnesota Lynx the last two seasons, winning the title in 2016 but falling just short last season. The Sparks went global with the 11th overall selection by picking Maria Vadeeva from Russia. Last but not least in the draft’s first round, was the Phoenix Mercury. They too decided to stay on the west coast for the 12th overall pick, selecting Marie Gulich out of Oregon State. Kicking off the second round, once again, were the Aces with the 13th overall selection. That turned out to be Jaime Nared of Tennessee. At the 14th overall selection was the Indiana Fever who chose Stephanie Mavunga from the Buckeyes. Hey, didn’t we just interview her on Episode 16 of The W Podcast? 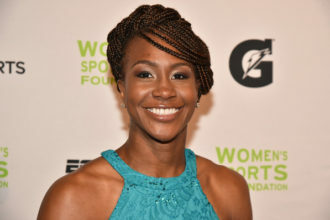 With the 15th overall selection was the Atlanta Dream, who acquired the pick via a trade that sent Bria Holmes, who will miss this season due to pregnancy, to the Connecticut Sun. The team that will see the return of Angel McCoughtry in 2018 picked Monique Billings out of UCLA. 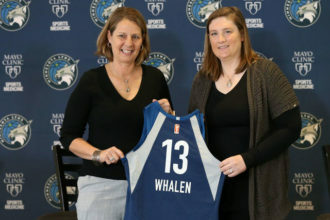 The Dream, with its first-year head coach Nikki Collen, also had the 16th overall selection and they chose Kristy Wallace out of Baylor. The defending champion Lynx went next at the 17th pick, going international with Ji-Su Park out of South Korea – who is 19 years old. In other words, this is a pick where they are thinking about the future. At the 18th pick were the Wings, and that was Loryn Goodwin out of Oklahoma. The 19th pick was that of the Washington Mystics, and that was Myisha Hines-Allen out of Louisville, meaning she will go from playing alongside Asia Durr with the Cardinals to playing alongside Elena Delle Donne and Kristi Toliver in the nation’s capital. Tonight, Myisha Hines-Allen joins the likes of UofL greats Angel McCoughtry and Shoni Schimmel when her name is called in the #WNBADraft. With the 20th overall selection – the Phoenix Mercury selected Tyler Scaife out of Rutgers. The Mercury also had the 21st overall pick and they chose Russia’s Raisa Musina. The Liberty picked Mercedes Russell out of Tennessee at 22nd, then the Sparks picked Shakayla Thomas out of Florida State with the 23rd pick. Rounding out the second round with the 24th pick were the Minnesota Lynx and that pick was Mercer’s Kahlia Lawrence. The Mercury kicked off the third round with the pick of Raigyne Louis out of LSU. It was a selection that was originally that of the Aces before they traded that pick to Phoenix. The Seminoles’ Imani Wright was the 26th overall selection by the Phoenix Mercury. After that, the Dream selected next and Georgia’s resident WNBA team had Georgia on its mind with the pick of Mackenzie Engram at 27th. The Sky also went local with the 28th pick with Amarah Coleman out of DePaul, who is already very familiar with Wintrust Arena as it is the Blue Demons’ new home stadium as well. Following that was the Seattle Storm, who picked Teana Muldrow out of West Virginia with the 29th pick. The 30th overall selection was that of the Dallas Wings and it was George Mason’s Natalie Butler. Another Duke player was selected with the Mystics chose Rebecca Greenwell at the 31st pick. Jill Barta out of Gonzaga was originally chosen by the Aces with the 32nd overall pick, but thanks to a trade with the Lynx, she will be on her way to the Twin Cities in exchange for Ji-Su Park and Kahlia Lawrence. The Sun had the 33rd pick and that was Mikayla Cowling out of California. 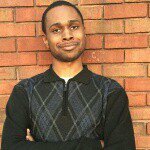 With the 34th overall selection, the Liberty selected Leslie Robinson out of Princeton (who happens to be the niece of two people by the names of….Barack Obama and Michelle Obama). A message we all can approve. The final two selections were Julie Reisingerova out of the Czech Republic to the Los Angeles Sparks and Minnesota’s very own Carlie Wagner to the Lynx.